My growing CLUSE watch collection just gets me so jazzed about putting outfits together. Why? Well, CLUSE has such a wide selection of styles that literally go with every vibe you can think of. I love these watches because they are great quality at an affordable price. Translation? You can buy one in gold and in silver and in army green without breaking the bank. I like that. 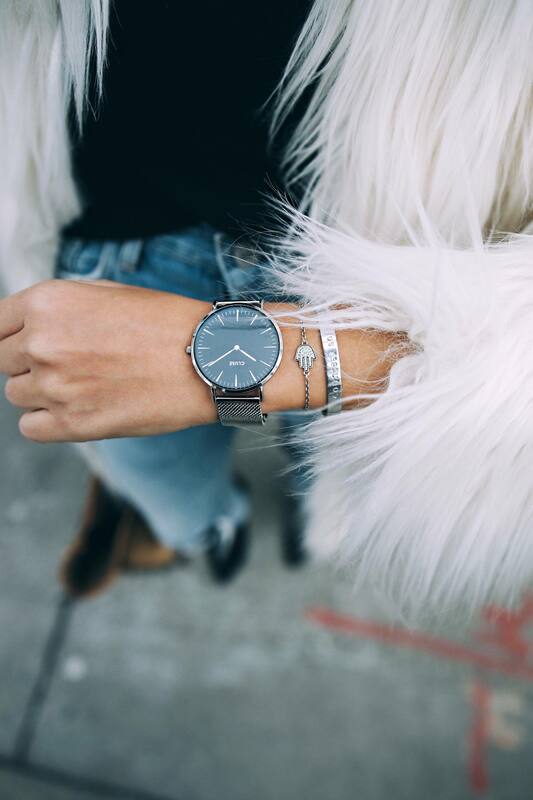 The CLUSE watch I styled this time around is my latest baby. 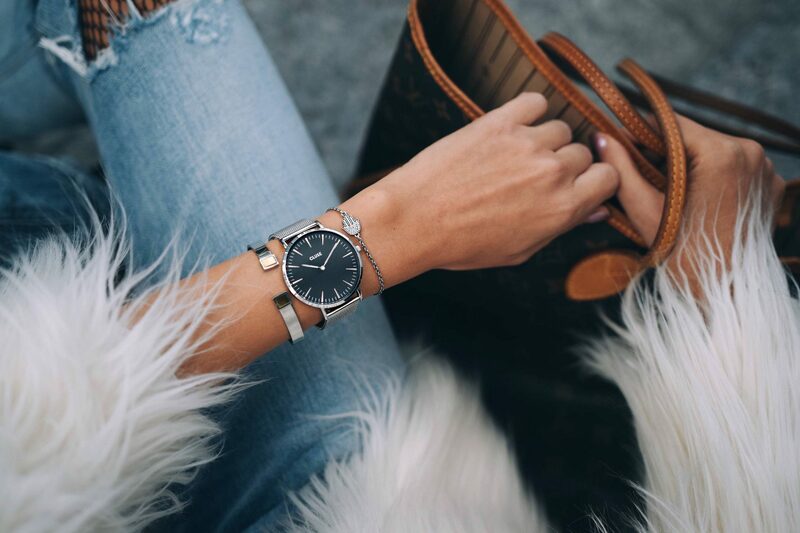 The CLUSE La Bohème in silver mesh with a black face. What I love, practically speaking, about this watch style is that you can change up the strap whenever you want. Secondly, I love that it is so easy to size. It literally takes only a few seconds to adjust the strap – no waiting, no extra cost, no removing links. Genius. Personally, I always like the face of my watch to be black or navy. I certainly have watches with white faces but I get most excited about black. I love the way it pops with silver and gold. To me, it is way more sophisticated than white. It just adds that extra dab of intrigue. Putting this outfit together was interesting. The vibe I was going for was Mediterranean socialite meets West Coast off-duty yoga teacher. The latter referring only to my ponytail. I mean, I think I did something right cuz you all loved my bejewelled turtleneck from the behind-the-scenes on my IG story. So what did I do? Secrets. I caved and bought fishnets because that’s what all the IG-famous models are doing. Layered them underneath my new boyfriend jeans that I am OBSESSED with. Went with a black top, added gemstones. I originally thought I could do a fun sneaker with this look but that would side too much with the off-duty yoga instructor reference. I only wanted namaste as an undertone. So, I went with stiletto ankle boots. You know, the kind you see rich Euro girls wearing in the cobblestone streets of Milan, effortlessly? 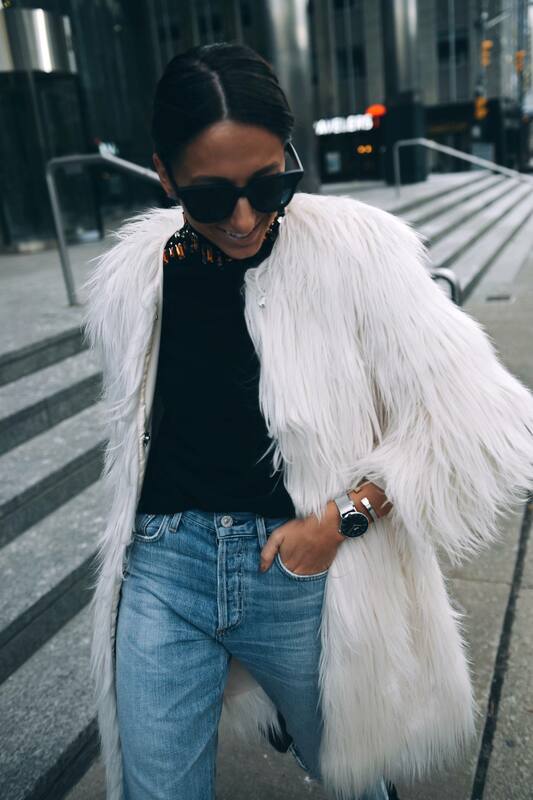 Lastly, I paired my faux fur coat in winter white with my CLUSE La Bohème silver mesh watch and a few silver bracelets to finish the look. I think I could rock this to a holiday party – don’t you? Leave me a comment and let’s chat! This post was sponsored by CLUSE however the opinions are my own. Previous Post What Party Hosting Style Are You? Love the look and the watch!!!!! Great article! Love the whole look! 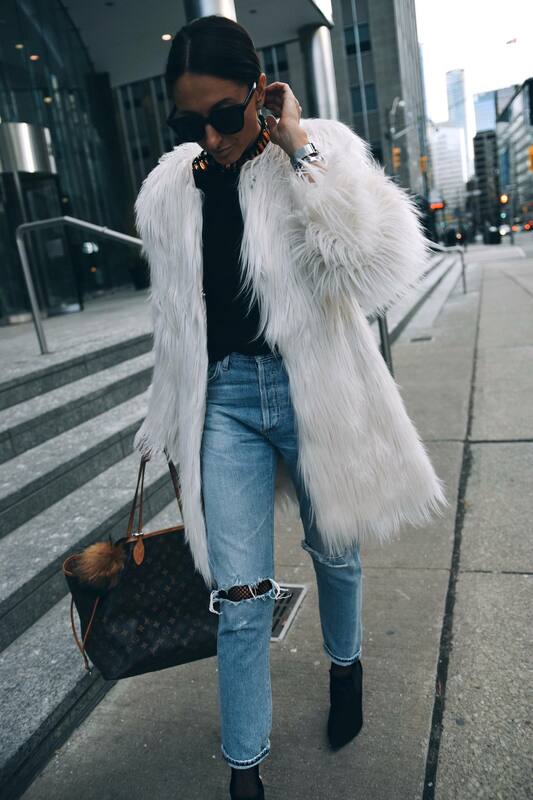 Where is the coat from?? ?